Colorado wide receiver Laviska Shenault Jr. (2) hauls in the go-ahead touchdown against Nebraska defensive back Dicaprio Bootle (23) during the second half of Saturday’s game in Lincoln, Neb. Colorado won 33-28. 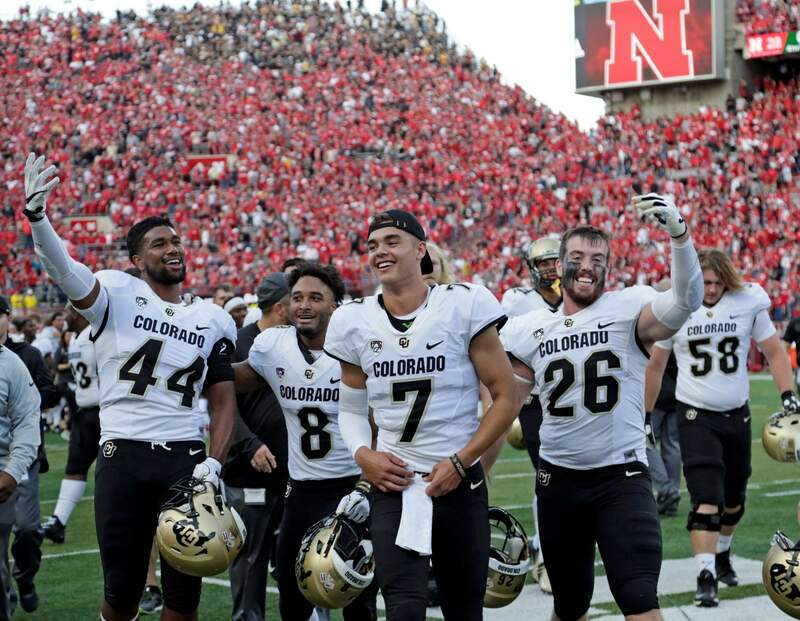 Colorado players including defensive back Dustin Johnson (26) and linebacker Jacob Callier (44) celebrate after the Buffaloes beat Nebraska on Saturday in Lincoln, Nebraska. LINCOLN, Neb. – Colorado beat in-state and border state rivals in succession, will play its next three games at home and has what could be the nation’s top passing combination in Steven Montez and Laviska Shenault Jr. Yes, all the vibes around the Buffaloes are positive since they followed their 45-13 season-opening win over Colorado State in Denver with a 33-28 victory at Nebraska on Saturday. The nonconference win was CU’s first in Lincoln since 2004 and first in the series since 2007, when the teams were in the Big 12. It’s only two games, but it’s enough of a sample for the Buffs to dismiss the preseason coaches’ poll that has them finishing fifth in the Pac-12 South after last year’s 5-7 season ended with three straight losses. 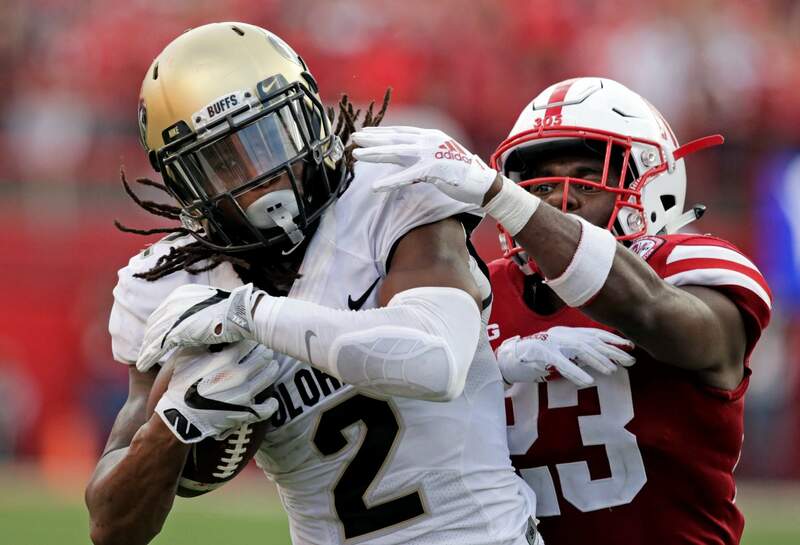 Nebraska lost fumbles on its first two series, allowing the Buffs to open a quick 14-0 lead. But the Huskers were up at halftime and led 28-20 with under 2 minutes left in the third quarter. The Buffs did this time. Montez threw an 8-yard touchdown to MacIntyre to pull the Buffs within a point, and his 40-yard strike to Shenault for the go-ahead score with 1:06 left in the game stood after the Buffs’ defense held at the end. Montez, who threw for almost 3,000 yards and 18 touchdowns last season, continues to put up impressive numbers. He was 33-of-50 for 351 yards on Saturday. He’s hit 73.3 percent of his passes for an average of 344.5 yards per game, ranking eighth nationally. He has seven touchdowns against one interception. Shenault has burst onto the scene after catching seven balls as a freshman last season. He had 10 catches for 177 yards against Nebraska leads the nation with 10.5 catches and 194 yards per game. He also has taken snaps out of the wildcat formation and scored on a 5-yard run against Nebraska. The Buffs’ offense moved the ball easily on their first two series and then had four straight three-and-outs. The offense picked up again in the second half after a couple adjustments were made to counter a Nebraska pass rush that had seven sacks. Next up is a game this week against New Hampshire (0-2) from the Football Championship Subdivision. Pac-12 play starts with back-to-back home games against UCLA on Sept. 28 and Arizona State on Oct. 6.